Lost Wax Casting Image 6 This is an image of the kiln which is glowing at 1350 degrees Fahrenheit. 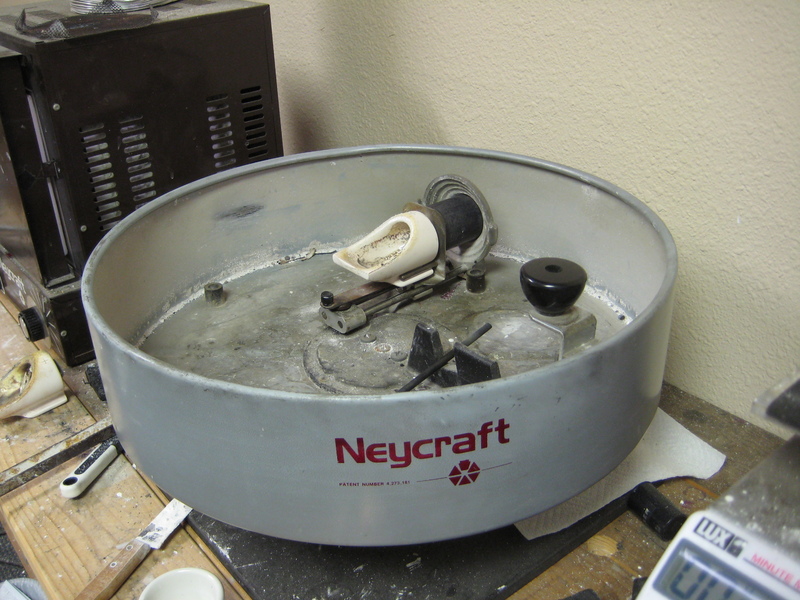 Lost Wax Casting Image 7 This is the centrifuge which drives the molten metal into the flask. 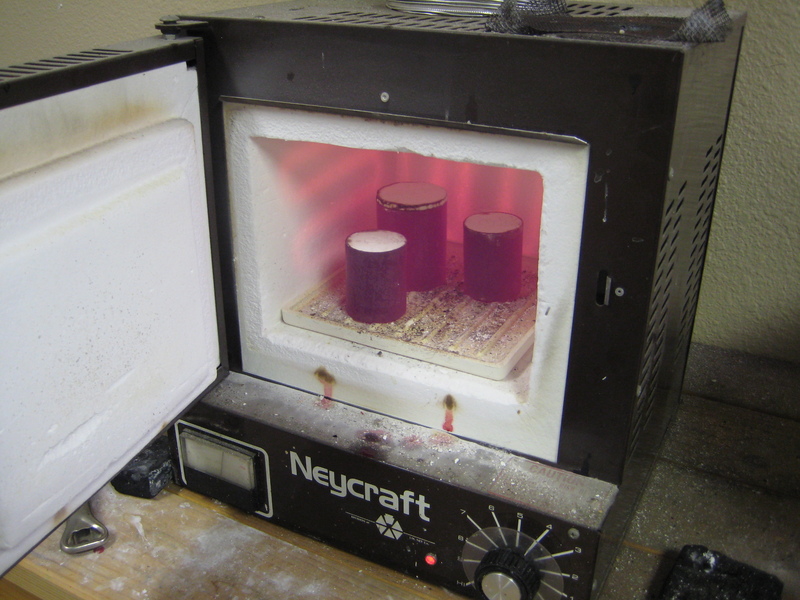 Lost Wax Casting Image 8 I am now heating the crucible with the fine gold. Lost Wax Casting Image 9 I am now stirring the gold to distribute the alloy metals and preparing to spin the centrifuge. Lost Wax Casting Image 10 WEEEEEEEEEEEEEE! 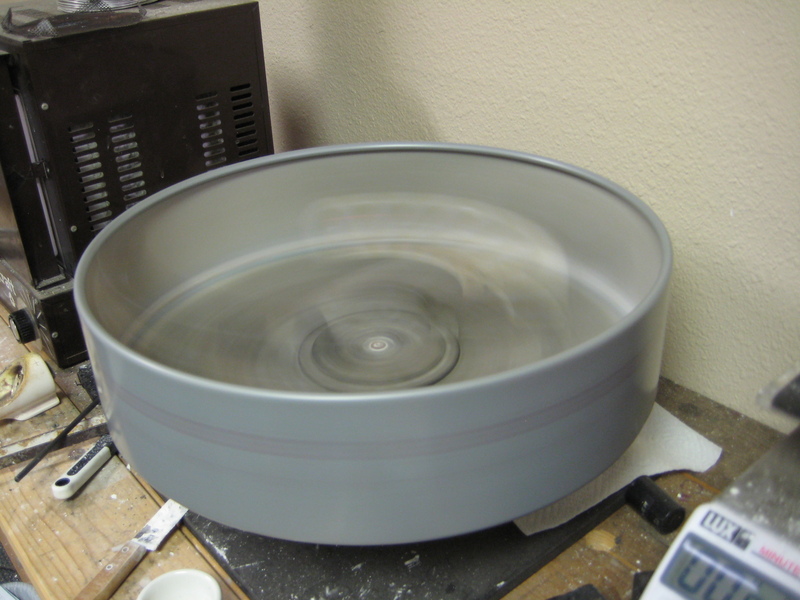 I use a centrifugal casting system. Essentially a large dynamic tub, the centrifuge is powered by a large spring, which is cocked and locked for the process of melting and casting the metal of choice. When released, it gives enormous pressure to the molten metal now flowing outward and into the vacated flask. Notice the angular structure in the middle of image number 7. 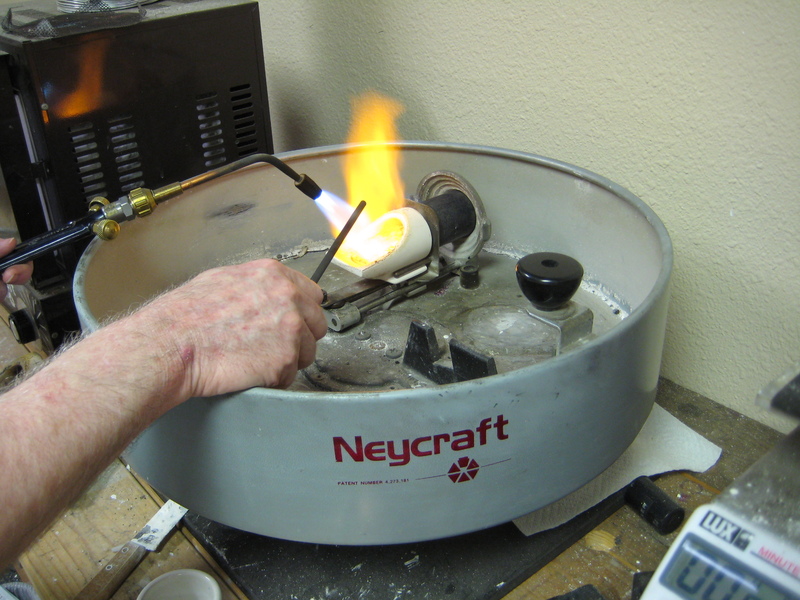 This cradle serves to hold the flask and next to it is a ceramic crucible which is where the precious metals are melted and prepared for casting. The flask is right out of the kiln, which is at the requisite 1350 degrees Fahrenheit. The wax model has melted out of the plaster flask, leaving a perfect negative copy of itself and is ready for casting. The cradle also is free to swivel upon release of the spring giving that much more impetus to the free-flowing metal. A short detour into basic metallurgy is required here. Forgive me in advance for using the word alloy too much but there is no suitable synonym. In a discussion of metals, an alloy is any metal comprised of a mixture of two or more metals and the world around us is largely built from them. If you are not interested in the mathematics of gold, you can comfortably skip the next paragraph. In order to produce my own gold alloys I start with 24 karat also known as pure or fine gold. Precious metals are usually purchased in the form of small round shot better facilitating accurate measurement. Determination of just how much gold I will need is the first order of business. Wax has the specific gravity of water, determined to be the value of 1gram/cubic centimeter. 18 karat gold has a S.G. of 15.5; therefore, by multiplying the weight of the wax model with its sprues attached by 15.5 grams gives me a target number for the finished weight of the casting. In this case fifteen grams are required for the ring itself but thirty grams are needed for the whole casting. In addition to the sprue, we have to consider gold for the button. This is the extra metal required at the base of the casting to give additional inertia to the casting. This extra mass helps the fluid metal to completely fill the casting and to be free of what is called porosity. Porosity is sponginess in the metal, which has a number of causes, but the result is a horrible surface, which is pitted, uneven and impossible to polish. Suffice it to say, porosity is a goldsmith’s nightmare. If thirty grams of 18 karat gold are needed for the casting, I multiply this by .75 which is the percentage of gold to alloy metal in 18k gold. The alloy metal is typically an alloy itself of silver and copper. Different percentages of these two metals can give a finished gold with vastly different colors and working characteristics. In this demo, I have measured out 22.5 grams of fine gold and 7.5 grams of alloy. Appearances here are quite deceiving as it seems that there are roughly equal amounts of both metals. The gold has twice the weight per volume or density as the alloy and the alloy comes in larger pellets so it appears to occupy an equal volume. The metal is carefully melted with an enormous flame produced by an oxygen/propane torch. You’ll notice a long thin black rod leaning against the crucible in the first image and being inserted into the molten gold in the second. It is made of rather pure carbon and is required to stir and thoroughly mix the gold and alloy as well as to clean impurities from the liquid and really hot metal. The hands belong to me. 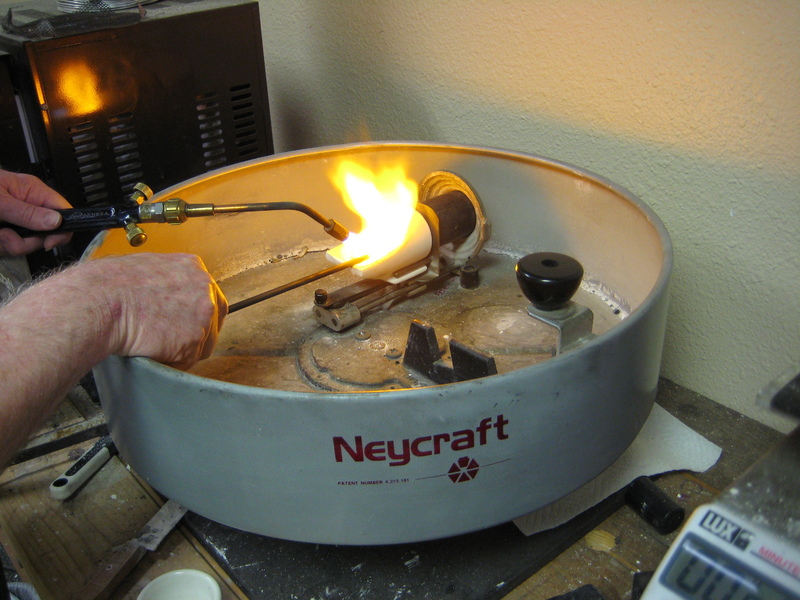 The fine gold is melted first as it has a dramatically higher melting point than the alloy addition. Once molten, the gold is ready to accept the alloy. This part can be rather touchy because with every grain of foreign metal added, the gold, now an alloy has a lower melting point and we are therefore a little closer to its boiling point. You don’t want to come anywhere close to gold’s boiling point because there lies more trouble in the dreaded form of porosity.